I pulled up an Excel speadsheet and, in my slightly cold-befuddled state, stated charting the sleeve. That worked fine, so I cast on. Hmmm, Kristi Porter has decreases (increases, for me) on both the beginning and end of a row. 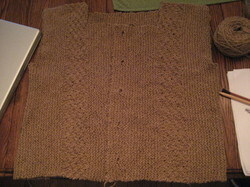 I only know how to cast on at one end of an established row....okay, back to the spreadsheet. So, I decided to cast on more stitches at one time for the increases to keep the cap of the sleeve with a shallow curve. The shallow curve is a function of my bulkier Rowan Summer Tweed. The pattern cleverly adjusts for the type of yarn you are using. I'm going to at least get the cap of this sleeve finished before I start on my chores for today. Tomorrow is a travel day - back to Independence, MO. I need to make sure the suitcase and briefcase have all the things I'll need--sometimes a challenge but I'll have a list. *g* I'm not looking forward to flying with the remnants of a cold and, worse, DH is flying, as well, and he was fully engaged by the cold as of this morning. AND he doesn't like to won't take OTC meds to relieve his symptoms. I'm crossing my fingers for a rapid recovery for him today. Happy Memorial Day! My thanks to all veterans for your service and sacrifice. Should you be doing that kind of math while still fighting that cold?